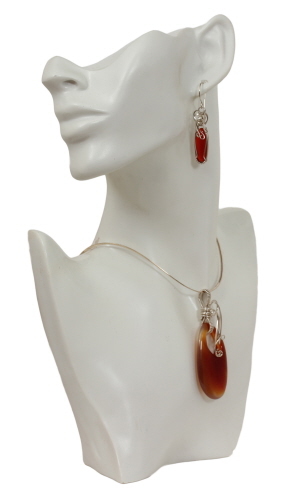 Carnelian, a variety of chalcedony, translucent, in shades of orange. 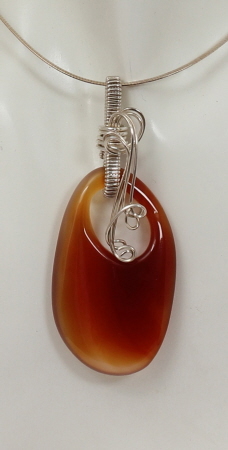 Pendant measures 2⅞ inches x 1⅛ inches and weighs 0.8 oz. The artistic flair of the bail adds uniqueness and design without drawing attention way from the natural beauty of the stone. Earrings measure 2 inches in length from top of earwire to bottom of dangle and weigh 0.1 oz each .. miniture pendants, each a mirror image of the other, made into earrings. Earwire hand formed. Argentium wire is used. A sterling silver chain would be an additional purchase. Model Melissa Moss, singer / songwriter. Model photo by Chuck Salisbury Photography. 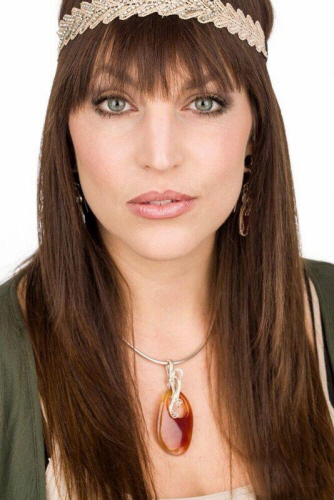 Special thanks to Lara Feamster with Key Faces Magazine PR & Branding.